Dealmoon Exclusive!Botanic Choice offers $10 Off $20 + Free Shipping with Orders Over $25 Via Code "DEALMOON"
Botanic Choice was established in 1910, the nation's oldest and largest provider of herbal remedies, liquid herbal extracts, and nutritional supplements. Advanced Apple Cider Vinegar Plus™ with Green Tea - Burns Fat and Boosts Metabolism Better Than Ever! CoQ-10 Wrinkle Cream™ - Keeps You Looking Years Younger! Arnica Plus Cream - Make Dark Circles & Spots Disappear! Advanced Apple Cider Vinegar Plus™ with Green Tea (Buy 6 for $35 after coupon) - Burns Fat and Boosts Metabolism Better Than Ever! CoQ-10 Wrinkle Cream™ (Buy 2 or more for $4) - Keeps You Looking Years Younger! Arnica Plus Cream (Buy 2 or more for $4) - Make Dark Circles & Spots Disappear! Botanic Choice offers $10 off $20 or more purchases via coupon code "103ANNIV". Free shipping on any order of $25. Advanced Apple Cider Vinegar Plus™ with Green Tea (Buy 2 for $14 after coupon) - Burns Fat and Boosts Metabolism Better Than Ever! Botanic Choice offers $10 off $20 or more purchases via coupon code "DEALMOON". 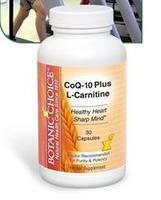 CoQ-10 Plus L-Carnitine is on sale for $8 each, plus $10 off $20. Use coupon code "wb5156" to get free shipping and Free 2010 wall Calendar. 25% off any order via coupon code "BC25P"